whether the vehicle is located in the roadway or is legally parked." Motor Vehicle Admin. v. Atterbeary, 368 Md. 480, 796 A.2d 75 (2002) held that a driver who was apparently awakened by a rescue squad, and who was then found by the police to be awake, behind the wheel, with the engine running, was capable of driving the car and therefore in actual physical control as used in the statutory definition of "to drive". Transportation Article § 11-127.1 ("'Under the influence per se' means having an alcohol concentration at the time of testing of 0.08 or more as measured by grams of alcohol per 100 milliliters of blood or grams of alcohol per 210 liters of breath"). Prior to October 1, 2001 this level was .10 and was called intoxicated per se. Brown v. State, 171 Md. App. 489, 910 A.2d 571 (2006)(.08 or higher test result creates a rebuttable presumption that the defendant was .08 or higher at the time of the offense). Definition of driving while under the influence. (As of September 30, 2001). Legislation enacted in 2001 replaced the term "intoxicated" with the term "under the influence." Since the legislature gave no definition, the definition for what was formerly called intoxicated remains applicable to under the influence. A person is intoxicated when a person's mental and physical faculties are impaired to a substantial degree from the use of alcoholic beverages: that is, a person's judgment and nervous system are affected from the use of alcohol to the extent that there is a substantial or significant impairment of coordination. [in relation to driving or operating a motor vehicle, a substantial or significant impairment of coordination exists when, as a result of the use of alcoholic beverages, a person lacks substantial capability to operate a vehicle in a manner that an ordinarily prudent and cautious person in full possession of his faculties, using reasonable care, would operate a vehicle under like conditions. 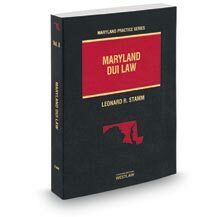 Aronson, Maryland Criminal Jury Instructions and Commentary, Second Edition (Michie 1988). Definition of driving "while impaired by alcohol." "Intoxication" and "impairment by alcohol" are two terms difficult to define with precision, yet not difficult to understand. Courts have been able to fashion interpretations of these terms. Instructive in this respect is the approach employed by an Oklahoma court in Synnott v. State where the appellant made an identical due process challenge. 515 p.2d 1154 (Okla.Cr.App.1973). The court, in upholding an analogous provision, held that the phrase "under the influence of intoxicating liquor" must be given its "commonly understood meaning which does not leave a person of ordinary intelligence in doubt." Because the state is one of general knowledge, it must be given a sensible interpretation. Id. at 1157. Therefore, ascribing to the word "impaired" its common meaning, we believe it is generally viewed as a state less than intoxication where consumption of alcohol has affected one's normal coordination. Brooks v. State , 41 Md.App. 123, 128, 395 A.2d 1224, 1227 (1979). DUI resulting in "life threatening injury"
Todd v. State, 61 Md.App. 332, 868 A.2d 944 (2005) the Court of Special Appeals defined "life threatening injury" for purposes of what is now codified as Criminal Law Article § 3-211, drunk driving resulting in "life threatening injury." The court rejected a vagueness challenge to the statute and instead defined "life threatening injury" as one that was "potentially fatal" or "very dangerous or serious with the possibility of death as an outcome." Is is scientifically accurate and reliable and legally valid? Farrell v. State, 364 Md. 499, 774 A.2d 387 (2001)(court found defendant not guilty of speeding and negligent driving after witnesses failed to appear, common law of double jeopardy precluded re-prosecution, citing, Daff v. State, 317 Md. 678, 566 A.2d 120 (1989)). In re Michael W., 367 Md. 181, 786 A.2d 684 (2001)(payment of driving in violation of alcohol restriction citation did not preclude prosecution for driving while intoxicated in juvenile court). State v. Beers, 21 Md. App. 39, 318 A.2d 525 (1974) When a statute creates an offense and specifies several different acts, transactions, or means by which it may be committed, an indictment [or other charging document] for violation thereof may properly allege the offense in one count by charging the accused in conjunctive terms with doing any or all of the acts, transactions, or means specified in the statute. Driving while intoxicated per se under § 21-902(a)(2) is not a lesser included offense of driving while intoxicated under § 21-902(a)(1). Meanor v. State, 364 Md. 511, 774 A.2d 394 (2001) . The defendant may pray a jury trial from the District Court for any offense that permits imprisonment in excess of 90 days. Md. Cts. & Jud. Proc., § 4-302(e)(2). Goode v. State, 41 Md.App. 623, 398 A.2d 801 (1979)(articulable reasonable suspicion that crime has been, is, or is about to be committed). Stop permitted even though officer did not see defendant drive, Bryant v. State, 142 Md.App. 604, 791 A.2d 161 (2002). Continued detention - Ferris v. State, 355 Md. 356, 735 A.2d 491 (1999); Blasi v. State, 167 Md. App. 483, 893 A.2d 1152 (2006), cert. denied, 900 A.2d 751 (2006). United States v. Horn, 185 F.Supp.2d 530 (D.Md 2002). Federal Magistrate Paul Grimm analyzed the admissibility of the standardized field sobriety tests in federal court under the Federal Rules of Evidence and Daubert v. Merrell Dow Pharms., Inc., 509 U.S. 579, 113 S.Ct. 2786, 125 L.Ed.2d 469 (1993). Judge Grimm concluded, among other things that the standardized field sobriety tests may be used as circumstantial evidence of impairment, and for probable cause. However, the Government may not use them as "tests" that may be passed" or "failed" and the officer may not offer an opinion that includes reliance on "clues." If offered as circumstantial evidence of alcohol intoxication or impairment, the probative value of the SFSTs derives from their basic nature as observations of human behavior, which is not scientific, technical or specialized knowledge. To interject into this essentially descriptive process technical terminology regarding the number of "standardized clues" that should be looked for or opinions of the officer that the subject "failed" the "test," especially when such testimony cannot be shown to have resulted from reliable methodology, unfairly cloaks it with unearned credibility. Any probative value these terms may have is substantially outweighed by the danger of unfair prejudice resulting from words that imply reliability. I therefore hold that when testifying about the SFSTs a police officer must be limited to describing the procedure administered and the observations of how the defendant performed it, without resort to terms such as "test," "standardized clues," "pass" or "fail," unless the government first has established a foundation that satisfies Rule 702 and the Daubert/Kumho Tire factors regarding the reliability and validity of the scientific or technical underpinnings of the NHTSA assertions that there are a stated number of clues that support an opinion that the suspect has "failed" the test. This is not to say that a police officer may not express an opinion as a lay witness that the defendant was intoxicated or impaired, if otherwise admissible under Rule 701. As recently amended, Rule 701 permits lay opinion testimony if: (a) rationally based upon the perception of the witness, (b) helpful to the fact finder and (c) if the opinion does not involve scientific, technical or specialized information. In DWI/DUI cases, however, the third requirement of Rule 701, that the lay opinion is "not based on scientific, technical, or other specialized knowledge," will take on great importance. A police officer certainly may testify about his or her observations of a defendant's appearance, coordination, mood, ability to follow instructions, balance, the presence of the smell of an alcoholic beverage, as well as the presence of exaggerated HGN, and the observations of the defendant's performance of the SFSTs__consistent with the limitations discussed above. The officer should not, however, be permitted to interject technical or specialized comments to embellish the opinion based on any special training or experience he or she has in investigating DWI/DUI cases. Just where the line should be drawn must be left to the discretion of the trial judge, but the officer's testimony under Rule 701 must not be allowed to creep from that of a layperson to that of an expert__and the line of demarcation is crossed if the opinion ceases to be based on observation and becomes one founded on scientific, specialized or technological knowledge. In his testimony and published writings, Dr. Cole was highly critical of the reliability of the SFSTs if used to prove the precise level of a suspect's alcohol intoxication or impairment. His 1994 article "Field Sobriety Tests: Are They Designed for Failure?," published in the journal Perceptual and Motor Skills, analyzed the 1977 Report, the 1981 Final Report, and the 1983 Field Evaluation report published by NHTSA regarding the SFSTs. (Def's.Memo, Ex. C.). (3) the accepted reliability coefficient for standardized clinical tests is . 85 or higher, yet the reliability coefficients for the SFSTs, as reported in the NHTSA studies, ranged from .61 to .72 for the individual tests and .77 for individuals that were tested on two different occasions while dosed to the exact same BAC. More alarmingly, inter-rater reliability rates (where different officers score each subject) ranged from .34 to .60, with an over-all rate of . 57. During his testimony at the Rule 104(a) hearing, Dr. Cole repeated his criticism of the reliability of the 1977, 1981 and 1983 studies but also testified about the Colorado, Florida and San Diego studies performed by Dr. Burns, styled as "field validation studies ." This testimony echoed Dr. Cole's written criticisms about the SFSTs' reliability as precise predictors of the level of alcohol intoxication and the SFST's validity as a measure of driver impairment in his 1994 article, co-authored with Ronald H. Nowaczyk, titled "Separating Myth from Fact: A Review of Research on the Field Sobriety Tests" and published in the Champion journal of the South Carolina Bar Association. Def's. Reply Memo, Exh. 1. Dr. Cole's primary criticisms, as discussed in his 1994 article, include, first, that the 1981 Final Report published by NHTSA claims an 80% accuracy rate for users of the SFSTs. This is misleading because when the actual data is examined with respect to the success rate of using the SFSTs to differentiate between drivers with BACs above 0.10 and those without, the critical population, the officers had "a 50/50 chance of being correct just on the basis of guessing." Id. at 539. Second, the SFSTs have a combined test-retest reliability rates of .77, while the scientific community "expects reliability coefficients to be in the upper . 80s or .90 for a test to be scientifically reliable." Id. at 540. When different officers tested the same subjects at the same BAC dose level on different days the reliability was only .59 - a 41% error rate. Dr. Cole contrasted these substandard reliability coefficients with that of the BAC machine, which is .96 or 96% reliable. Id. at 540-41. Third, Dr. Cole argued that in order for the SFSTs to be valid predictors of BAC they must "not only identify individuals above a BAC level of 0.10 as 'failing', but also identify individuals below .10 as 'passing'." Id. at 541. The data from the NHTSA 1977 Report, however, shows that the validity of the HGN, OLS and WAT SFSTs was ".67, .48, and .55, respectively, with a combined validity coefficient of .67." Id. This means that use of the SFSTs results in an unacceptably high erroneous arrest rate, if the tests are used by the officer to make arrest decisions based on BAC levels being in excess of . 10. Fourth, Dr. Cole was particularly critical of claims that the NHTSA SFSTs have been "validated" in a "field setting." In this regard, he stated that the 1977 and 1981 NHTSA studies were done in a laboratory setting, and the difference in conditions in a controlled lab are dramatically dissimilar from field conditions that can be expected when officers employ SFSTs at all times of day and night in widely disparate weather and traffic conditions and where issues of officer safety may influence how the test is performed. [FN20] Id. at 542. Dr. Cole stated that the NHTSA 1983 Field Evaluation purported to be a field validation study, but it failed to meet the recommendations of the authors of the NHTSA 1981 Final Report that the SFSTs be validated in the field for eighteen months in locations across the country. Id. Dr. Cole also stated that Dr. Burns herself has testified that the SFSTs adequately have not been field tested [FN21] Id. Because of its widespread use, the FST battery has been assumed to be a reliable and valid predictor of driving impairment. NHTSA has done little to dispel that assumption. Law enforcement cannot be blamed for its use of the FST battery. Training documents refer to NHTSA reports and provide what appears to be supporting evidence for the validity of the FST battery. In addition, there is little doubt that individuals who have high BAC levels will have difficulty in performing the FST battery. However, what the law enforcement community and the courts fail to realize is that the FST battery may mislead the officer on the road to incorrectly judge individuals who are not impaired. The FST battery to be valid must discriminate accurately between the impaired and non-impaired driver. NHTSA's own research on that issue ... has not been subjected to peer review by the scientific community. In addition, a careful reading of the reports themselves provides support for the inadequacy of the FST battery. The reports include low reliability estimates for the tests, false arrest rates between 32 and 46.5 percent, and a field test of the FST that was flawed because the officers in many cases had breathalyzer results at the time of the arrest. NHTSA clearly ignored the printed recommendations of its own researchers in conducting that field study. Id. at 546. (Emphasis in original). In 2001, the legislature amended Cts. & Jud. Proc. Art., § 10-309 to allow evidence of the refusal in evidence, (in effect overruling Krauss v. State, 322 Md. 376, 587 A.2d 1102 (1991)(so long as the defendant is not claiming the police improperly caused a refusal to submit to a blood or breath test for alcohol the State may not introduce the refusal in evidence). A Fifth Amendment challenge to the admissibility of the refusal in light of this legislation was rejected by the Court of Special Appeals in Wyatt v. State, 149 Md.App. 554, 817 A.2d 901 (2003). Wyatt relied heavily on the Supreme Court decision in South Dakota v. Neville, 459 U.S. 553 (1983). As of September 30, 2005, if the state provides notice 15 days prior to trial in Circuit Court and 5 days prior to trial in District Court, knowing refusal, found beyond a reasonable doubt by the fact finder, subjects the defendant to a sentencing enhancement of 2 months and $500. State v. Weisbrod, 159 Md.App. 488, 859 A.2d 664 (2004), cert. den., 384 Md. 582, 865 A.2d 589 (2005)(police do not have to advise defendant who refuses the State's breath test of the right to an independent medical test under Cts. & Jud. Proc. Art., § 10-304(f))(but an early draft of the opinion suggests police might have to advise defendants who do submit to the test of the right). McAvoy v. State, 314 Md. 509, 551 A.2d 875 (1989)(the right recognized by Sites depends upon a request and the police need not give advice of Sites to detainees.